(Francisco Kjolseth | The Salt Lake Tribune) A group of mostly women show up at the Wallace F. Bennett Federal Building to protest against Supreme Court nominee Judge Brett Kavanaugh on Thursday, Sept. 27, 2018. (Francisco Kjolseth | The Salt Lake Tribune) Lorrie Schmanski, left, is joined by her daughter Allison as they join a group of mostly women at the Wallace F. Bennett Federal Building in Salt Lake City to protest against Supreme Court nominee Judge Brett Kavanaugh on Thursday, Sept. 27, 2018, with the words I believe, on their hands in reference to testimony by Christine Blasey Ford who accuses Kavanaugh of sexually assaulting her in 1982. 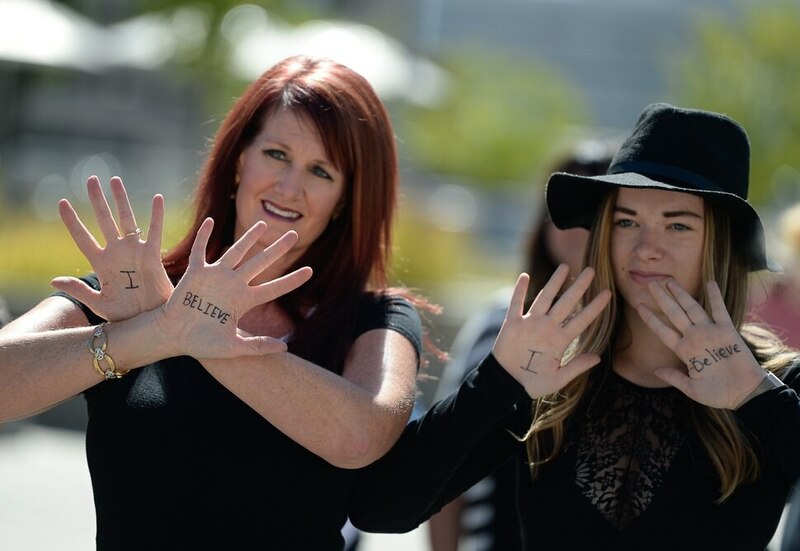 (Francisco Kjolseth | The Salt Lake Tribune) Diahann Jensen writes I believe, on her hands in regards to testimony by Christine Blasey Ford as a group of mostly women show up at the Wallace F. Bennett Federal Building in Salt Lake City to protest against Supreme Court nominee Judge Brett Kavanaugh on Thursday, Sept. 27, 2018. (Francisco Kjolseth | The Salt Lake Tribune) Lorrie Schmanski joins a group of mostly women at the Wallace F. Bennett Federal Building in Salt Lake City to protest against Supreme Court nominee Judge Brett Kavanaugh on Thursday, Sept. 27, 2018, with the words I believe, on her hands in reference to testimony by Christine Blasey Ford who accuses Kavanaugh of sexually assaulting her in 1982. (Francisco Kjolseth | The Salt Lake Tribune) Liz Rank, right, joins a group of mostly women at the Wallace F. Bennett Federal Building in Salt Lake City to protest against Supreme Court nominee Judge Brett Kavanaugh on Thursday, Sept. 27, 2018. (Francisco Kjolseth | The Salt Lake Tribune) A group of mostly women show up at the Wallace F. Bennett Federal Building to protest against Supreme Court nominee Judge Brett Kavanaugh on Thursday, Sept. 27, 2018, with one sign bringing attention to the Anita Hill testimony 27 years ago. (Francisco Kjolseth | The Salt Lake Tribune) A group of mostly women show up at the Wallace F. Bennett Federal Building to protest against Supreme Court nominee Judge Brett Kavanaugh on Thursday, Sept. 27, 2018. (Francisco Kjolseth | The Salt Lake Tribune) Judy Wilkins joins a group of mostly women show up at the Wallace F. Bennett Federal Building to protest against Supreme Court nominee Judge Brett Kavanaugh on Thursday, Sept. 27, 2018. (Francisco Kjolseth | The Salt Lake Tribune) A group of mostly women show up at the Wallace F. Bennett Federal Building in Salt Lake City to protest against Supreme Court nominee Judge Brett Kavanaugh on Thursday, Sept. 27, 2018. (Francisco Kjolseth | The Salt Lake Tribune) Brianna Shepard of Santa Monica, CA, who was in town to attend a conference of educators, joins a group of mostly women at the Wallace F. Bennett Federal Building to protest against Supreme Court nominee Judge Brett Kavanaugh on Thursday, Sept. 27, 2018. (Francisco Kjolseth | The Salt Lake Tribune) A group of mostly women show up at the Wallace F. Bennett Federal Building to protest against Supreme Court nominee Judge Brett Kavanaugh on Thursday, Sept. 27, 2018. (Francisco Kjolseth | The Salt Lake Tribune) A group of mostly women show up at the Wallace F. Bennett Federal Building to protest against Supreme Court nominee Judge Brett Kavanaugh on Thursday, Sept. 27, 2018. 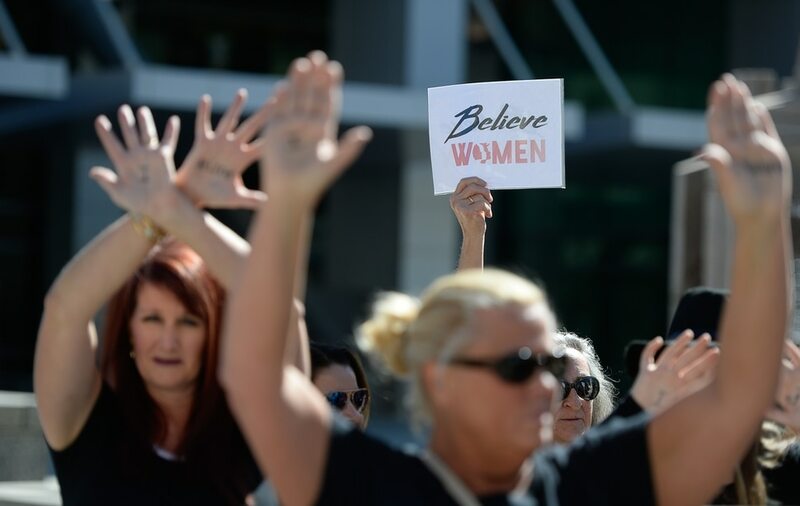 About 20 protesters rallied outside the Salt Lake City office of Sen. Orrin Hatch on Thursday, slamming the Utah Republican for making “inappropriate” comments about the women who have accused Supreme Court nominee Brett Kavanaugh of sexual misconduct. Hatch is a member of the Senate Judiciary Committee that heard from Kavanaugh and one of his accusers, Christine Blasey Ford, on Thursday. Leading up to the dramatic hearing, the senator said Ford must be “mistaken” in her allegations. He dismissed an account from a second woman who came forward as “phony.” And he said he was “naturally suspicious” when a third woman reported witnessing Kavanaugh harass women at a party. Rank, who helped organize the protest outside Hatch’s office, carried a sign that read, “Shame on Orrin.” The group gathered around noon and picketed against his remarks for about an hour. Lydia Merl, 51, of Park City, added that she felt “almost every comment is inappropriate” that Hatch has made during the process. “I’m here in solidarity for women who are brave enough to put everything on the line,” she said. Her poster included speech bubbles around a picture of Hatch, quoting controversial things he’s said about the women and Kavanaugh. The flipside simply noted, “I still believe Anita,” a reference to Anita Hill, who similarly testified in 1991 that then-Supreme Court nominee Clarence Thomas sexually harassed her when they had worked together. Kavanaugh is President Donald Trump’s Supreme Court nominee to fill the seat of retired Associate Justice Anthony Kennedy. Earlier this month, Ford, a California research psychologist, came forward alleging that Kavanaugh assaulted her when they were in high school. She has said that he got drunk, pinned her down and touched her inappropriately during a party and that she escaped before he could remove her clothes.